Thompson: Thompson Terminal Point technique is a system of analysis and a special table that reduces the amount of energy needed to adjust your spine. Graston: Using these curved stainless steel instruments, we can successfully resolve adhesions and scar tissue, offering a pleasant sense of release. 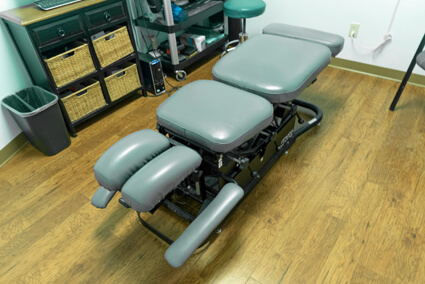 Spinal Decompression: Our specially-equipped table will ever-so-slowly stretch your spine. And then relax it. Stretch. And relax. Excellent for disc cases. If you’ve been to a chiropractor before and prefer to be adjusted in a particular way, let Dr. Woods know. We want you to relax, enjoy and fully benefit from your chiropractic care.